Mix all ingredients together for the garlic-ranch sauce. Spread mixture over the top of the pizza dough. 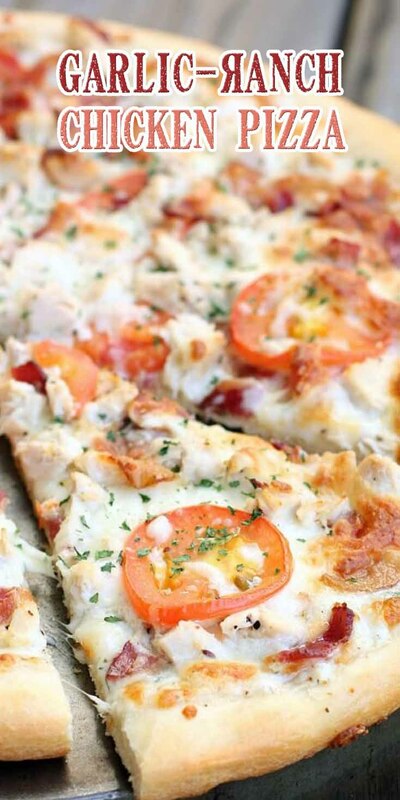 Sprinkle 1 cup of the mozzarella cheese over top, followed by the chicken, bacon, and tomatoes. Sprinkle remaining cheese on top. Bake at 450°F for 10-12 minutes, or until crust is golden brown and cheese is bubbly. *For grilled pizzas: Oil your grill and turn heat to medium-low. Shape dough into long, slipper-shaped pieces. Brush dough with olive oil and grill for 2 minutes on one side, with the grill cover on. Flip to the other side and brush again with olive oil. Cook for 2 minutes, with the grill lid on. Remove crust to a plate and add toppings. Return to grill and cook just until cheese is melted, 1-2 more minutes.